1.FC Saarbrücken have a truly fascinating history in particular relating to the Second World War and the annexing of Saarland from the rest of Germany. The club were founded on the 18th April 1903 as the football wing of Turnverein 1876 Malstatt. The club splintered away from the parent club in 1907, and rebranded two years later as FV Malstatt-Burbach. The club played in various Bezirkligas and Kreisligas up until 1935 when the Third Reich reorganised German football into sixteen regionalised Gauligas. The club were initially placed in the Gauliga Südwest and then moved across to the Gauliga Westmark. They won this league in 1940 and 1943 and it was in the latter year they made it to the final of the play-off system but lost 3-0 to Dresdener SC. This effectively meant they were national runners up for the German championship. As the war intensified the club could only continue fielding a side by temporarily merging with SC Altenkessel. The conclusion of the war saw Saarland, still under French occupancy, annexed from the rest of Germany. 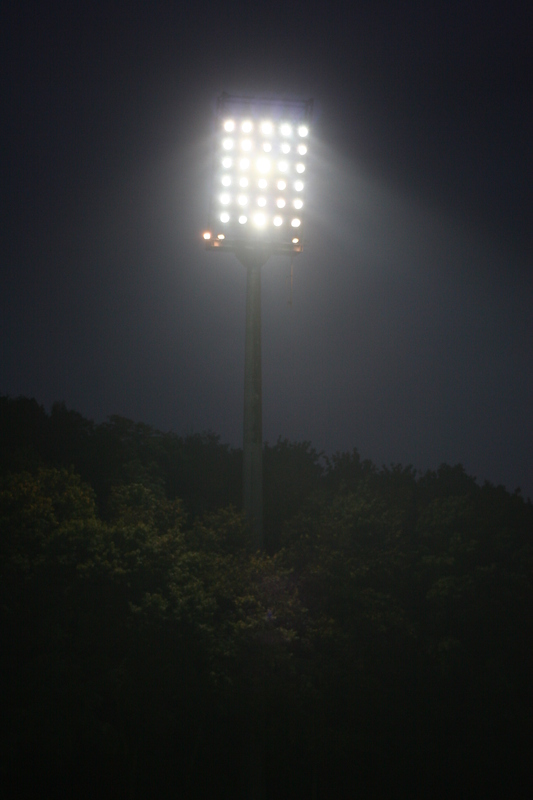 The club were allowed to reform, under their present name, and spent three seasons in the Oberliga Südwest-Nord. Under French occupancy there were attempts to get Saarland recognised as an autonomous state and, indeed, Saarland entered the qualification for the 1952 Olympics and the 1954 World Cup as their own entity. 1. 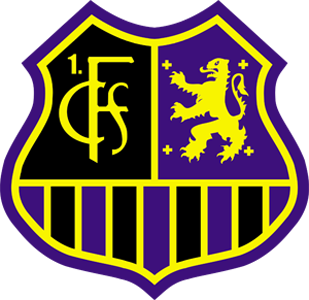 FC Saarbrücken were ejected from German football in 1948 and briefly played in a hastily arranged competition called the Ehrenliga but rather than play in what was deemed as a “puppet” league, the club decided to join the French Football League having registered their name as FC Sarrebruck. The club were placed in the second tier and promptly won the championship, six points clear of Girondins de Bordeaux. The French Football Association denied them promotion and the belief was they did not want to risk a Germanic side potentially being crowned French champions. The club left the French league and played friendlies and tournaments for a few season before being readmitted to the German federation in 1952. In February 1951 one of these friendlies saw Saarbrücken take on the mighty Real Madrid who were only a few years away from five straight European Cup wins. 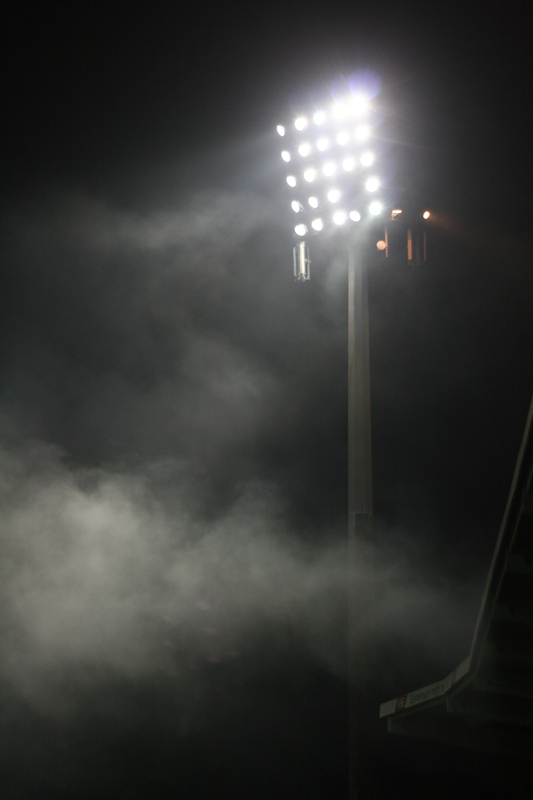 The hosts won 4-0 with the Madridstas blaming the cold weather for the humbling defeat. The state of Saarland itself carried on producing its own postage stamps and coinage, the Saar franc, until July 1959 when the “Kleine Wiedervereinignung” (the small reunification) saw the demise of the Saarland Protectorate and full reintegration into West Germany. The club remained a strong force winning the Oberliga Südwest in 1952 and 1961 before the Bundesliga was formed in 1963. It was something of a surprise however that Saarbrücken were elected to the new competition as other clubs in the area such as Neunkirchen and Wormatia Worms were considered to have better playing history. Since those momentous times the club has been only sporadically successful and in 1995 a financial crisis saw them forcibly relegated to the third tier. For the 2007/08 season the club had sunk to the fourth tier but then enjoyed two straight promotions to take their place in the 3. Liga, a new third tier of the Bundesliga formed that had been formed in 2008. The club remained at this level until last season when a disastrous campaign saw them finish bottom of the table having hired four coaches during the season! 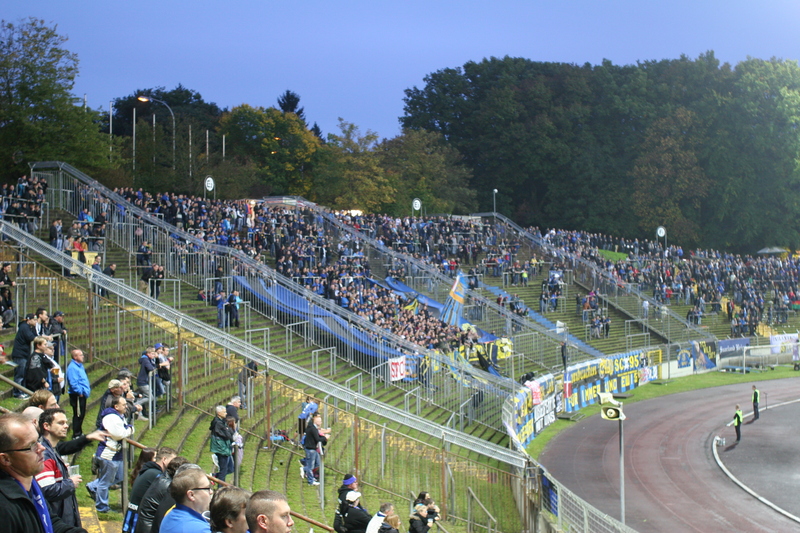 The club has played at the Ludwigsparkstadion since it opened in August 1953, defeating Rot-Weiss Essen 3-1 in the opening game. Apart from some modest renovations in 2000 the huge bowl like stadium has changed little in the intervening years. 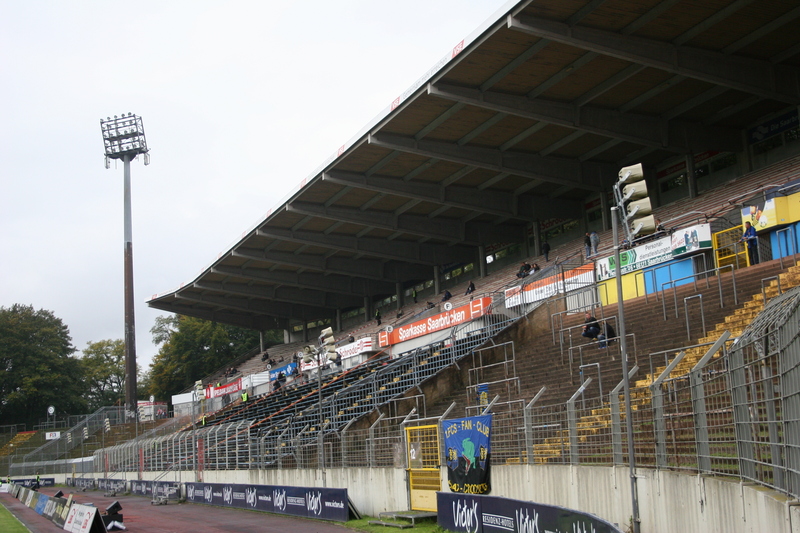 This fantastic old stadium also plays hosts to the American football team, the Saarland Hurricanes. In March 1954 with the fervour for Saarland’s independence at its peek, the fledgling nation were paired against West Germany for a qualifying match for the 1954 World Cup. 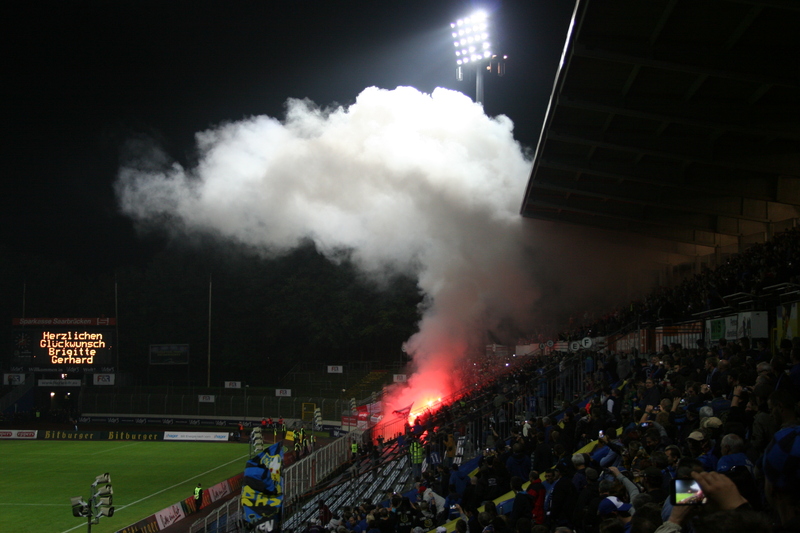 Unsurprisingly Saarland lost 3-1 but the Ludwigsparkstadion held 53,000 for that fixture. 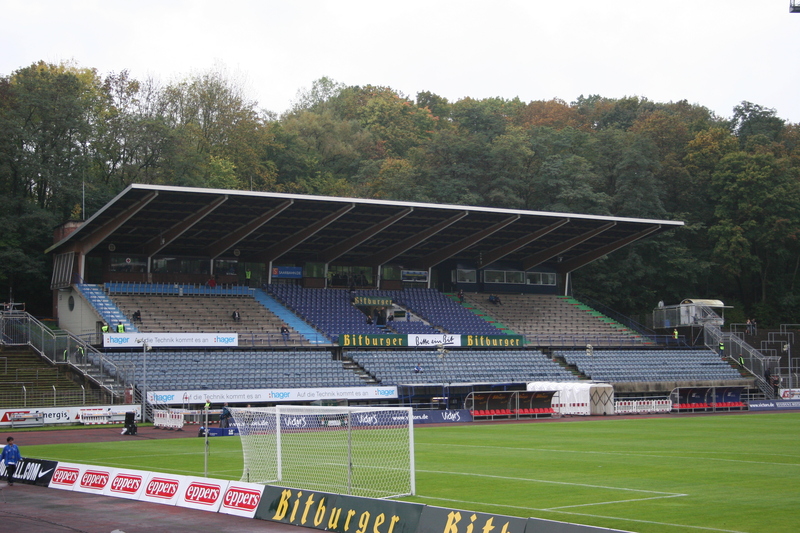 Its modern day capacity of 35,303 only provides seating for a shade over 8,000 so ample terracing survives although in recent years there have been rumblings of building a new arena style stadium within the bowl itself much in the way the old Zentralstadion was modernised in Leipzig. However any feasible plans have yet to materialise and should be contextualised in that as long ago as 1998 then club president, Reinhard Klimmt, described his own stadium as a “hovel”. 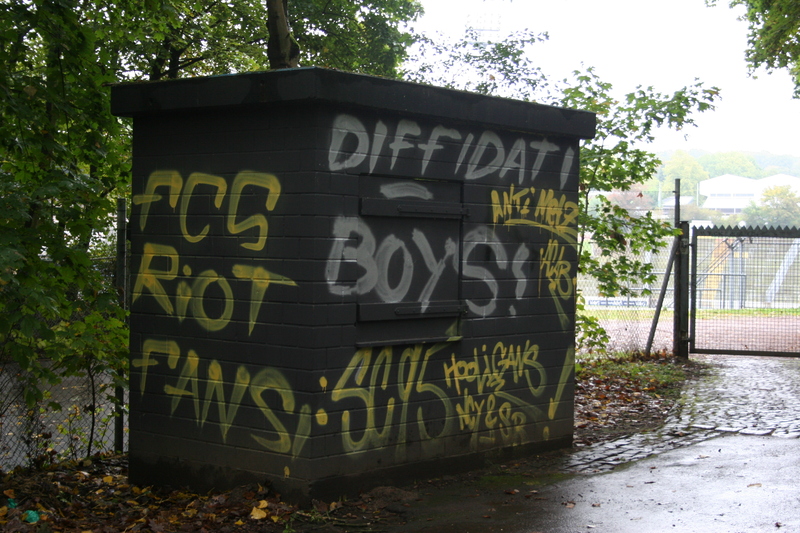 Prior to playing at the Ludwigsparkstadion the club had a somewhat nomadic existence particularly in their formative years. 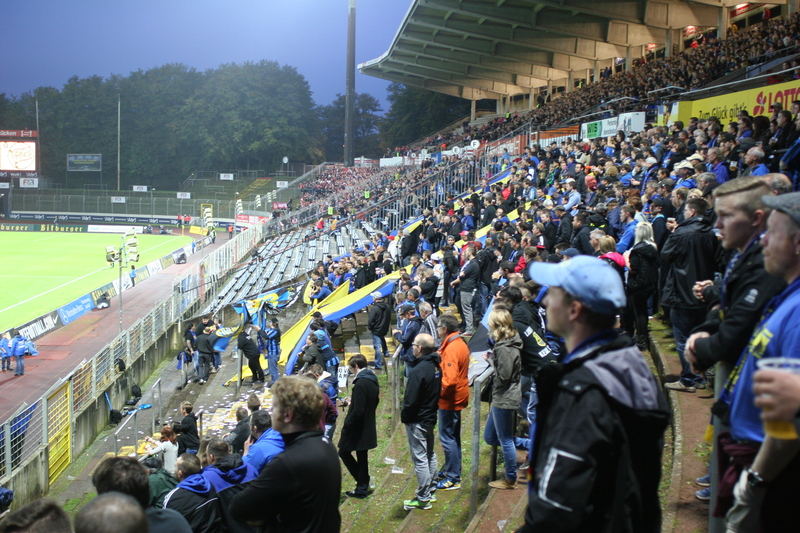 Initially they played on a school field before using grounds called Rotplatz and Am Wallenbaum. These venues were only short term solutions as they were both hemmed in by and subsequently lost to residential housing. In September 1910 they moved to a better facility called the Terrain an der Lebacher Straße. 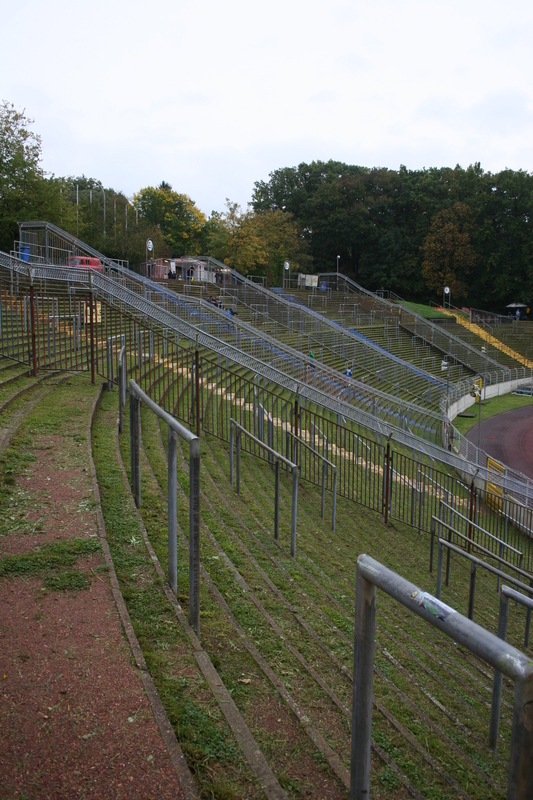 However, after the First World War another move was needed and the Sportplatz Ludwigspark became home until 1953, although many post World War II matches were staged at the Stadion Kieselhumes which is home to Oberliga side, FC Saar 05 Saarbrücken. 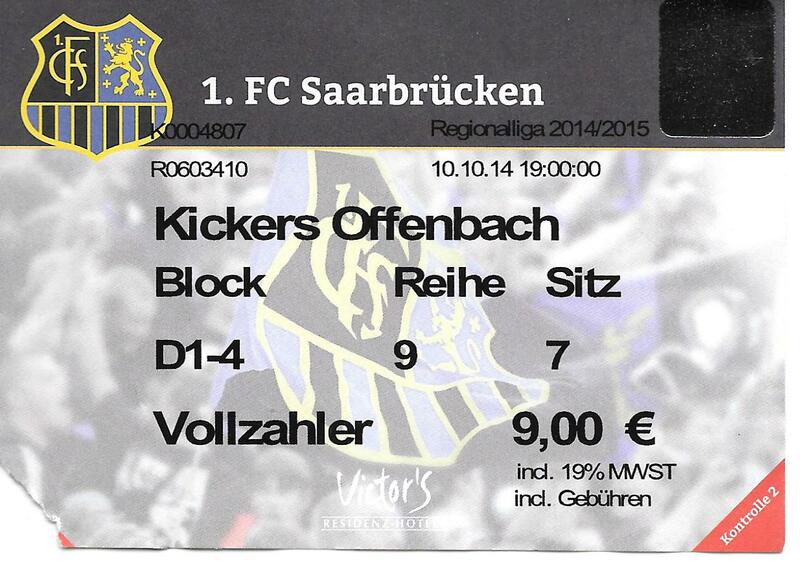 This evening’s game saw Saarbrücken take on Kickers Offenbach in a fourth tier match in the Regionalliga Südwest. It is a very evenly matched contest and many chances are squandered. A header from centre back Daniel Döringer gives the hosts the lead which lasts until eight minutes from time. The visitors substitute Steven Von den Burg scored with virtually his first touch. It’s a deserved equaliser and the bosterious pyrotechnic wielding Offenbach fans celebrate a point shared in this great old stadium. 1. David Hohs; 5. 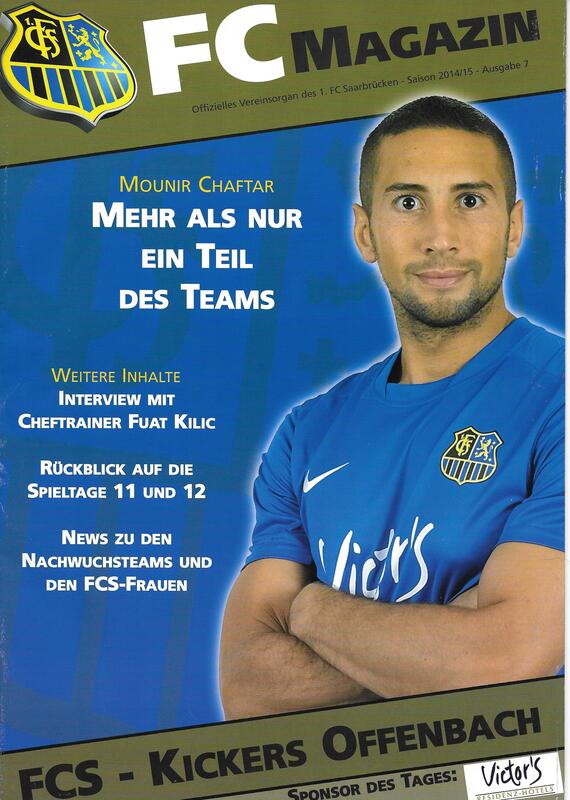 Mounir Chaftar; 6. Daniel Döringer; 9. Matthew Taylor; 14. Jan Fiesser (c); 17. Christian Sauter; 20. Marius Willsch; 22. Aleksandar Pranjes; 24. Alexander Hahn; 43. Sven Sökler; 44. Peter Chrappan. Subs: 7. Dennis Wegner (for 20, 63 mins); 8. Lukas Kiefer; 10. Patrick Zoundi; 23. Andre Mandt (for 17, 82 mins); 25. Giovanni Runco; 27. Marco Meyerhöfer (for 22, 69 mins); 28. David Salfeld. 16. Daniel Endres (c); 4. Klaus Gjasula; 5. Giuliano Modica; 6. Matthias Schwarz; 13. Jan Biggel; 14. Christian Cappek; 15. Alexis Theodosiadis; 20. Martin Röser; 23. Dennis Schulte; 30. Denis Mangafic; 31. Markus Müller. Subs: 1. Lucas Menz; 8. Maik Vetter; 9. Benjamin Pintol (f0r 6, 75 mins); 11. Fabian Bäcker (for 13, 67 mins); 17. Stefano Maier; 22. Steven Von der Burg (for 20, 80 mins); 32. Jan Hendrik Marx. Yellow Cards: Chaftar, Fiesser, Sauter (all Saarbrücken), Cappek, Müller (both Kickers). This entry was posted in Travel, Matches & Stadiums and tagged Germany, groundhopping, Kickers Offenbach, Ludwigsparkstadion, Regionalliga, Saarbrücken, Südwest by peterrmiles. Bookmark the permalink. Pretty impressive stadium, but going to seed a bit? Liked the history of it all!